Do you ever want a cake, but you don’t want an ENTIRE cake because you know you will just eat it all? (Or maybe that’s only me!) To solve the dilemma of eating an entire cake on my own, I started making mini cakes. Now I can enjoy a “cake,” but not feel horrible when we eat the whole thing! These cans are 5 inches in diameter. They are formula cans from my first son. Now the formula cans are cardboard, but you could easily go to the store and look in the canned goods section to find a can the size you want. Those large cans of tomatoes or coffee come to mind. Of course, you could just buy actual mini cake pans, but they will cost you 10 times more AND they won’t come with food in them! 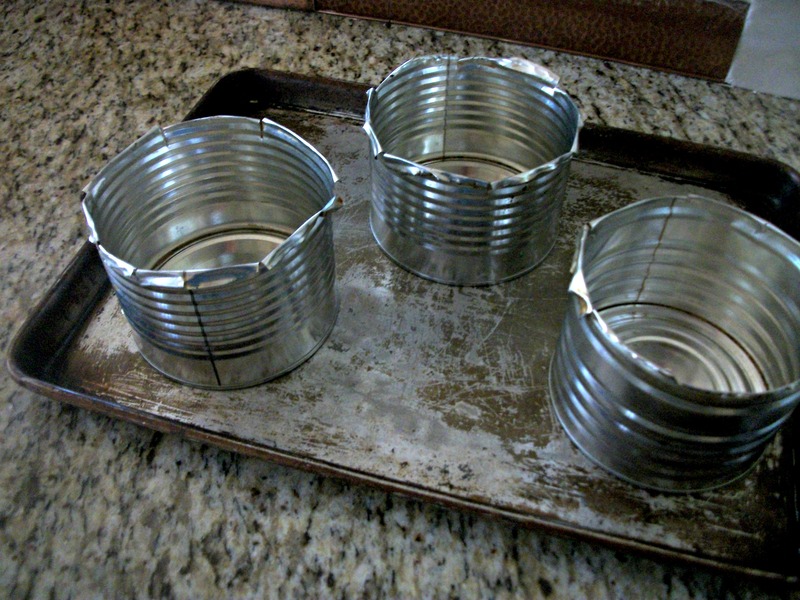 I actually used tin snips to cut down and the edges of the can and then rolled down the tops. My recommendation is to NOT do this! Even rolled down, those edges are very sharp, and I always use extreme caution when I am washing them. (By the way, you will want to wash your cans by hand and immediately dry them to avoid rust). You don’t really need them to be shorter, so I would suggest leaving the cans as they are. The cakes dome a lot, especially when you use a cake mix. If I am making the cakes just for my family, I don’t bother to trim off the top. If I want them to look really fancy, then I take the time to make them perfectly flat. In my opinion, half of what makes a cake look really good are the proportions. It has to be tall enough, and to make it really spectacular, it has to be very precise – perfectly straight sides and a perfectly flat top. But hey – this cake was for a quick dessert, and although my family appreciates a beautiful cake, they aren’t picky! I have never had trouble getting my cakes out of the pans. The first time I used the cans, I was worried about the ridges in the sides, but they have never given me a problem. I don’t do anything special – just spray with baking spray and that is it! Since I made this cake on the spur of the moment, I just used what I had on hand – strawberries, nutella, and canned chocolate frosting. I cut the mini cake in half and then spread nutella and layered on sliced strawberries. Then I frosted the whole thing in chocolate frosting. Honestly, it wasn’t as good as you might think. The strawberries just kind of got lost in all the chocolate. Strawberries really work best with plain old whipped cream, but I used what I had! There you go! A cake just the right size for one night’s dessert. Thanks for this idea, Rachel. I’m going to try this! so fun! I love this I did and the fact that I don’t have to have a whole cake.